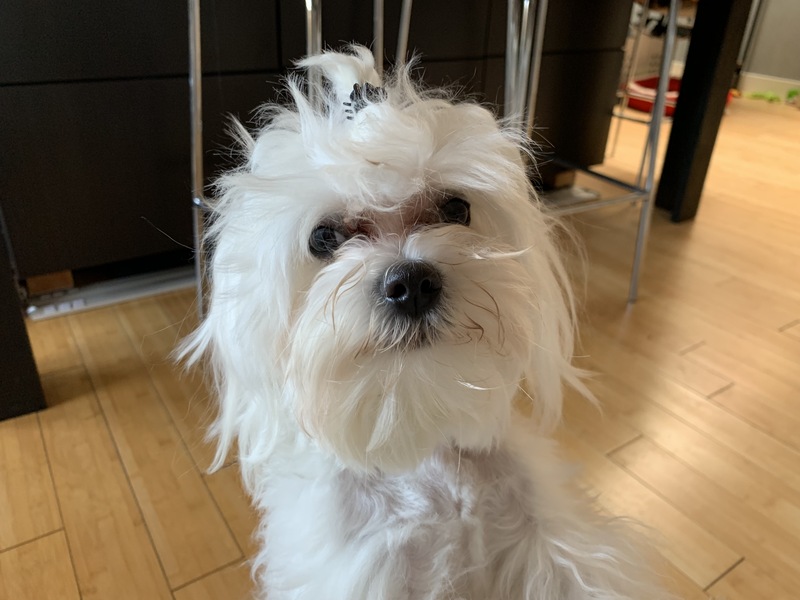 For this Santa Monica dog training session, we help a 1 year-old Maltese named Frankie who doesn’t listen to his guardian and barks for attention. Frankie barked as soon as I walked in. Then he barked some more while we discussed his daily exercise. He barked when we talked about rules. He barked when we talked about petting with a purpose and passive training. When we started to talk about his being intact, about an hour or so into the session, the barking stopped. I spent a good amount of time discussing the benefits of neutering. As any LA dog behavior expert will tell you, there are as many dogs euthanized as puppies are born each year. There is nothing wrong with getting a dog from a breeder, but I always make sure to ask any clients thinking about breeding their dogs if there is anything in their life they did well the first time they did it. Frankie will benefit from neutering more than probably just about any dog I have worked with. He protests and challenges his guardian when she tries to put on his booties, marks in the house, demand barks, selectively listens and demands attention when she is on the phone. He needs his energy turned down and many of the issues previously mentioned will be greatly reduced by taking a trip to the vet. I recommended that she finds a vet who uses a laser for the neutering surgery which makes it bloodless and speeds up the recovery time. Its important to note that neutering the dog won’t solve these problems. However, it will make fixing them far easier if the guardian can flip the leader follower dynamic. I suggested a number of rules and showed the guardian ways to incorporate structure into repeated tasks. Another one of the ways I like to modify unwanted dog behaviors like a dog who barks when their owner is on the phone is to stop engaging or interacting with the dog the INSTANT it starts to offer the behavior I dislike. Frankie’s guardian has a puppy play gate set up diving the apartment to limit his marking (a huge correlation to being an intact male) gives her an amazing ability to do this easily. I explain how to use a barrier to stop unwanted dog behaviors in the free dog training video below. While disengaging from the dog when it starts to demand bark or offers any other unwanted dog behavior seems like a small thing to do, its power is in the repetition. If the guardian gets into a habit of IMMEDIATELY puts Frankie onto the other side of the partition or steps over it herself to get away (this is called a negative punishment), Frankie will stop barking for attention and many of his other unwanted behaviors. This is a big secret to stopping a dog for barking for attention. And if the guardian increases his daily exercise (especially any time he gets “barky”) gets into a habit of petting with a purpose and rewarding desired behaviors through passive training, Frankie will start to sit or lay down to ask for attention as well as stop his jumping up and demand barking. Because Frankie is so friggin’ cute, its going to be a challenge for the guardian to stop giving in to his demands. But if the guardian can make these small but important changes, she should be able to get him to stop demand barking and get the dog to listen and respect her. The good news is the guardian doesn’t have to study up on how to become a professional Maltese dog trainer to do this. It will just take some discipline. To help the guardian remember all the dog behavior tips I shared in this in home dog training in Santa Monica, we shot a roadmap to success video you can check out below.